So you just bought a bird, now what? Well besides the basics like food and a cage, you will need to consider getting your new feathery friend some toys. After all, a happy bird is a healthy bird. So you might be thinking, “what kind of toys do I get a bird”? Well, fret no more, because we have you covered. We have put together a list of our top 10 favorite birds toys on the market. We want your bird to be happy because a happy bird makes a happy human. A recent update has been done to highlight the benefits and quality of the best bird toys on the market. The information has been rewritten and updated to make it more digestible and easier to read. Also, there have been some changes to our FAQ section, so if you have any questions, please stop by and check it out at the bottom of the page! Happy shopping! While a great cage and good are important, this list is all about how to keep your bird happy, so we want your bird to have the best toys. Out top 10 list is here to help you find the best and most fun toys for your birds. We want it to be easy and an effortless decision for you so you can be happy too. So we have done the research to give you the pros and cons for each toy and a brief guide at the bottom to highlight a few factors for you to think about picking out a favorite toy or two for your new friend. 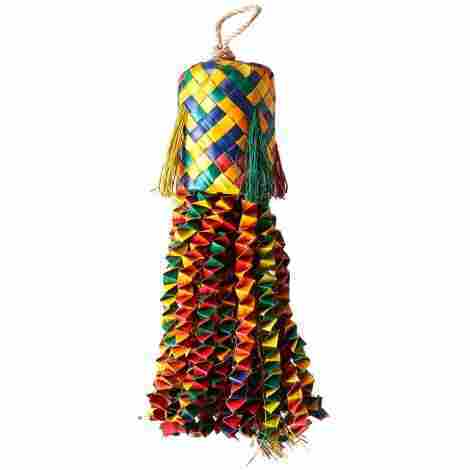 This colorful bird toy is produced with a striking variety of bright strands and activities, the clever toy is woven and twisted in a great array of safe and interesting concertinas. The top is safely secured with a substantial twine knotted to ensure that even a vigorous pecker or chewer will be out of harm’s way when playing. 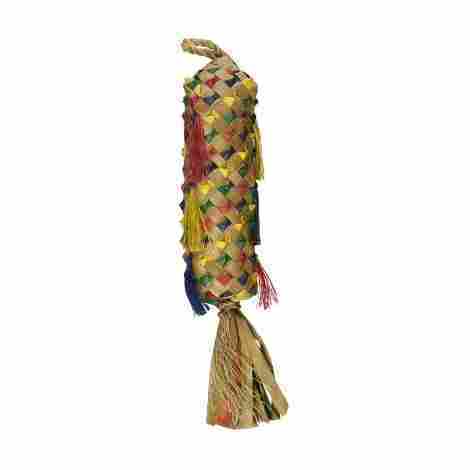 It has a unique cone-shaped, tightly woven top quarter that has plenty of extra secure tassels that will help to entertain any bird for hours of happy playing. The octopus bird toy has a multitude of hanging arms that encourage play and foraging, there are hidden within them plenty of extra inserts for a more varied play time. It is packed with shredders and is robust enough to allow a bird to grasp on with its feet and peck away to its hearts consent. The bright colors and tassels, combined with the multiple arms help to keep a bird entertained, and this is beneficial in more ways than one. It encourages exercise and can help build dexterity in both legs and feet – whilst at the same time keeping the bird's interest for longer. 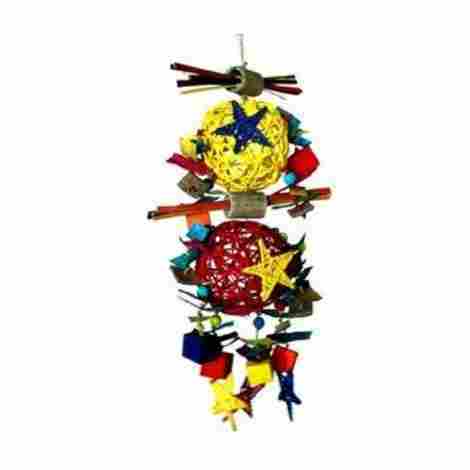 When taking into consideration the overall health and well being advantages of this Planet Pleasures octopus piñata toy, it is easy to justify that both and cost are very well represented in it, money spent on this will be money well spent. The Bonka Bird Toy 1969 is produced with entertainment and durability in mind, the toy measures fourteen inches long – more than enough length to entertain a bird for long periods. It has five stainless steel spoons that are produced with safety in mind, they are all different sizes and hung at intervals to keep the birds' interest. It offers a welcome semi-noisy toy and the brightly contrasting, tough acrylic beads will draw any birds attention for an interesting playtime. 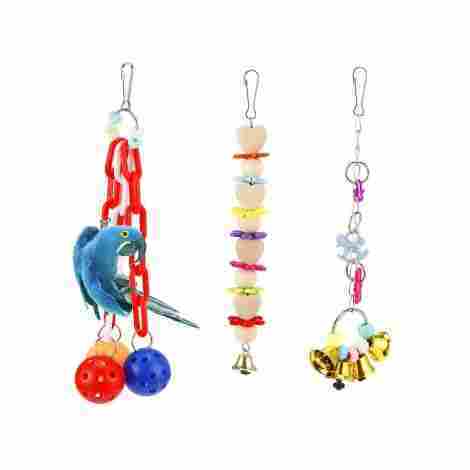 The clips attached to the toy are screw clips so even the most inquisitive and determined bird will struggle to force it loose, the toy is versatile enough to be hung horizontally across the cage, or even in a vertical position to give variety in the play and sustain interest. 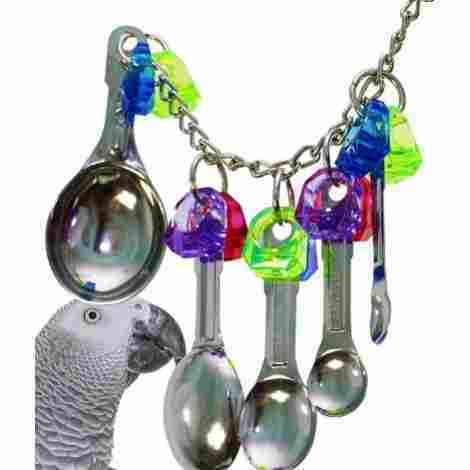 The chain that the spoons and charms are hung from allow a bird to be creative in the way they choose to play, the spoons are also different sizes and will respond in corresponding tones when jangled and pulled, the benefits of encouraging climbing and clutching may help leg and foot dexterity and strength. 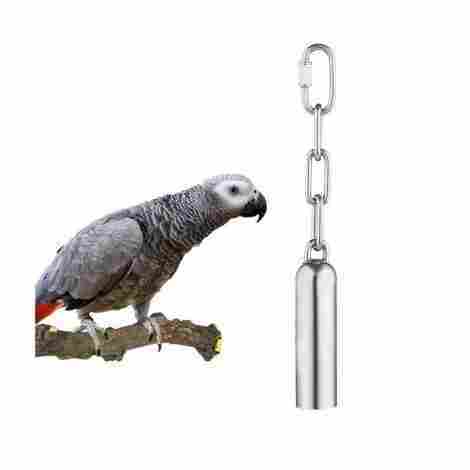 Overall, when considering the true balance between coat and value – taking into account the durable stainless steel, acrylic beads, and hardy clips; it is easy to see that this bird toy represents excellent value for money. Some birds may not like it. This exciting and innovative toy is presented as three legs of brightly colored discs that are secured safely with twine that should stand up to long periods of use. The blue, green, yellow, tan and neutral discs are colored safely and placed alternately to entice the bird and hold their attention for hours of fun. It encourages foraging and chewing motions to replicate a bit of what’s on the outside; and can improve the birds clutching and holding techniques as it works its way up the legs. The Bird Kabob Chiquito is offered as being totally safe for birds to chew on, and this is endorsed by it’s one hundred percent biodegradable production. The softwood material it is manufactured with proffers to be completely toxin free and perfectly safe to use. The action of chewing and shredding is recommended to help with a birds health and well being, and this toy offers many hours of fun. Not only is it good for shredding, it also encourages the bird to exercise as it climbs across and up and down the legs. The Bird Kabob Chiquito is reasonably priced for the many hours of fun any bird may get from it. The substantial rope hanger makes it easy enough to secure within the cage, overall – this bird toy is very good value for money. 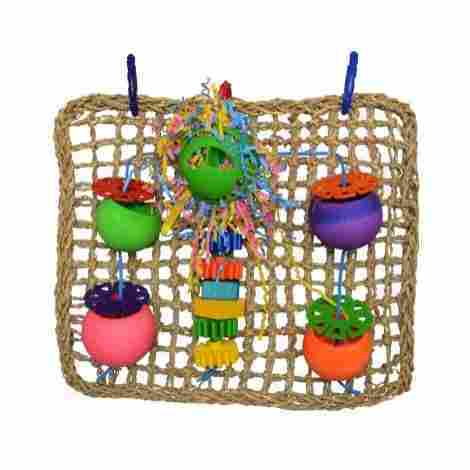 This seagrass woven bird toy is suitable for most birds and offers a great activity center for many hours of safe and happy play. The great variety of toys will encourage healthy climbing and clutching whilst providing different things to keep birds entertained, the interactive toys are spaced to provide variety and are all produced using bright, safe and striking colors that any bird will adore and be attracted to over and over, The exercise it will encourage is a bonus feature with this toy, and because it is incorporated into a fun activity – the birds will happily strengthen their feet, legs and beak without even realising the benefits achieved. The activity toy has four intelligent foraging pots that can be filled with a healthy treat and encourage the bird's natural instinct for finding their food. The contrasting lids are placed so that they have to be manipulated by the bird to get the treats inside. The large variety of different shaped toys and the brightness of the colors are sure to keep even a fussy bird happy, there are spinners of different shapes and a shredding mop at the top, all the activities help to maintain physical and mental well being. This Super Bird Creations seagrass toy has great features that will not only stimulate and encourage exercise but will also push natural foraging behaviour. Over all, for the innovative design and endless play possibilities this is excellent value for the money. The MEWTOGO Natural toys come in a pack of three different designs that all have safe and nontoxic additions to them. They are offered in bright colors and each design has been cleverly constructed to encourage the bird to clutch and play whilst elevated. Toy one has large and tough linked rings and a fun ball on the end of each drop, toy two has a noisy edge with a bell on the bottom and spaced colored beads with wooden chewing hearts and toy three offers a variety of acrylic charms and bells. Overall this three pack of bird toys serve different functions that will encourage the bird to swing, clutch, pull and chew to their hearts content. Each toy has its own useful clip that can be hung from anywhere in the cage for immediate gratification. 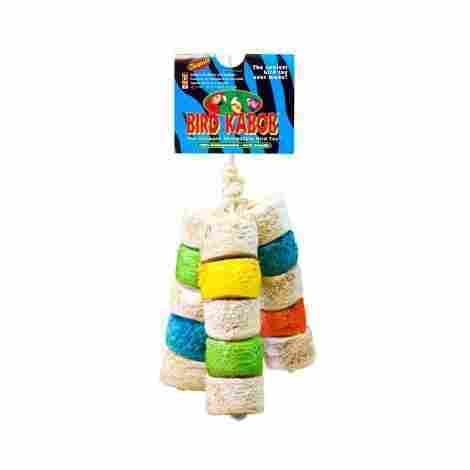 Each toy is a different length so offers better variations for the bird to elevate from, and the different textures and colors of the chew toys are all bright and inviting, encouraging exercise in a fun way for hours of healthy play. The balance between both cost and value is equal, the value is increased by the fact that there are three toys in one purchase and each offers different activities for the birds, benefitting not only the wallet, but the health and well being of the bird too. This twenty-inch bird toy is packed full of different parts to help keep boredom at bay and provide many hours of play, The bright colors will entice the bird, and allow elevated exploration of the various shapes and textures included in it. It benefits from encouraging the bird to climb, clutch and chew in a safe and healthy way, the toy is easily put up in the cage and has been designed to last. It is made with bird safe, nontoxic materials and won’t cause harm to the birds whilst at play. The different shapes of the added toys on the length of this include enough space to enable the bird to climb and hang on at various heights and offers a change in texture to help alleviate boredom for longer periods of time. The toy offers encourage natural instincts with shredding, chewing and foraging – all activities that are known to help maintain your birds’ overall health, happiness and wellbeing, as well as enabling exercise. The Galactic Crunch bird toy offers a good variety of different activities in one for most birds, the inviting colors and varying textures help to keep the birds interest and encourages healthy behaviour and play for long periods. This bright and inviting toy is designed to entertain and keep a bird’s interest, it encourages foraging and is ideal for helping a healthy body and mind. The 1839 Bonka toy is safely attached to any cage with a substantial clip that is nontoxic, the whole piece in linked securely and coated in safe plastic. There are plenty of reasons for the bird to forage, chew and shred, and the easily climbable shape helps to improve foot and leg dexterity and strength. The overall size of this toy is approximately six inches high and six inches wide, so there is ample material to get stuck in. There are a variety of shapes, materials, and textures to keep a bird occupied and entertained for hours. 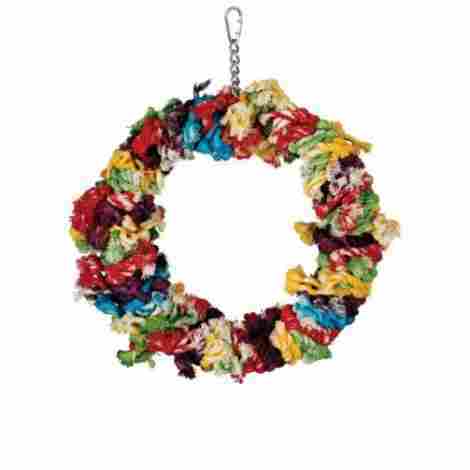 The Bonka Bird Toy 1839 has a mixture of available hanging positions that will provide the bird with many alternative reasons to clutch and chew. The center is filled with safe, bird-friendly paper that is an ideal mimick of natural foraging motions. The cost of this toy is well balanced when considering the value, the bright attractive colors and varied materials that are included will provide lots of entertainment. Money spent on this toy is well justified and it is great value for money. This yoyoung bird toy is produced using stainless steel and boasts being heavy duty for durability when used in play, it has substantial screw clips that will stay shut even with the most determined and inquisitive bird. It is available in two handy length sizes; seven point seven inches and eight point five inches, with an internal bell measuring three point nine inches so, is just long enough and noisy enough to keep the bird's interest for longer periods. This heavy-duty bird toy is made from tough, durable stainless steel and is able to withstand many hours of knocking, clawing and pecking. The polished surface will reflect light for a shimmering effect and the bell will entertain without being harmful. The handy screw clips mean it can be hung from virtually anywhere in the cage, so it can be vertical fun straight from the top, or for a bit of variety it can also be hung from the side – this will change the tone of the bell and maintain interest. 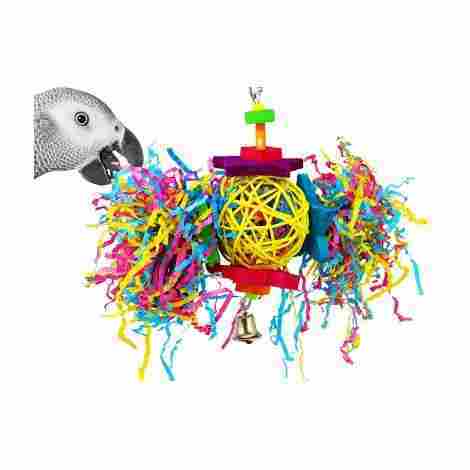 The price of this tough and durable bird toy is well balanced when consideration is taken in terms of the safety aspect it has and when that is combined with the entertainment the bird will get with it, it is overall great value for the money. The Planet Pleasures Spiked parrot piñata is designed to be entertaining and practical, it is produced using a woven twine that is interlocking and safe for birds to chew on. The body of the toy is solid enough to use as an elevated perch, and the addition of tassels at various intervals gives a bird plenty to get and keep interest. It is available in four sizes; a small at seven inches long, a medium at ten inches, a large at fourteen inches and an extra large option at seventeen inches. The piñata toy body is filled with natural shredding stuffing which encourages the bird to forage as it would in the wild, this mimicking of natural behavior benefits the bird not only for its entertainment value but also for the mental well being that makes a happy bird. The spiked piñata proffers to be made using only recycled and renewable materials so there is less man-made synthetic waste made during the production. The large tassel at the bottom is made with the same friendly material and gives an extra feature for the bird. The bird toy is balanced well looking at both cost and value, the hours of fun for birds is well worth the money, and the natural products used in its manufacture add to the overall value. An added value bonus is the peace of mind maintained with a pet-friendly product. This bird toy is an interesting shape for playing with, not only can the bird sit, perch and clutch at it – it can also go through the center hoop to increase activity. It has been made with safety in mind and the quick link fastener attaches to the cage with no messing or tools required. The bright ring is put together with soft cotton that makes it an ideal toy for chewing, shredding and pecking, and it has the added bonus of being able to swing. The one percent cotton boasts being an aid for preening activities and encourages the natural behavior of chewing and shredding that they would do in the wild. The toy can be attached to the top of the cage, or to the side for a no swinging option. The design of the toy not only encourages natural behavior; but can offer up a snug place to sit and rest, and the plucking motions during the pulling of the cotton, may assist in over plucking of feathers. This Paradise Toy Caitec cotton ring is well priced when taking into consideration the versatility it offers with the encouraging and mimicking natural actions, the pet safe materials used and the enticing bright colors mean it is great value for money. So, we get bored sometimes, as do our children, our dogs, our cats – practically every pet or human will at some point suffer from boredom. The same thing day after day over and over can often make us feel like we are going insane, and the same needs to be taken into account with our feathered friends. Birds, by nature, are made to fly, to forage and be inquisitive and what you put into their cage should attempt to replicate those natural tendencies. Bored birds are usually unhappy and unhealthy and could even have a reduced lifespan as a result of this. Giving your bird toys alleviates boredom and introduces new things for them to play with and explore. They are good for encouraging exercise which, even for birds is a good positive step. The well being of your bird can depend on what you give it to play with, so choose carefully and make sure they have something interesting to fly at, talk to, peck, chew, climb on or nudge. There are many benefits to providing a stimulating environment for your bird and there is no shortage of different varieties to try, chop and change. Depending on what type of bird you have, it may be a good general rule of thumb to check either individual product specification or buy instore from a reputable supplier and vendor. Exercise toys are always recommended because they improve overall foot dexterity, hanging toys and swings are great because they provide many hours of entertainment for your bird whilst serving a practical purpose. Toys on the bottom of the cage are also beneficial for this reason and also improve beak health with the collecting and moving motions. Mirrors are a fabulous addition to the cage, birds communicate freely and effectively, and this action is encouraged with mirrors. Some birds will spend many an hour happily having a conversation with themselves; notably here as well is the social side, if you have one or more birds, or are intending to increase your lot – socialization encouraged with mirrors can be invaluable. Toys that are noisy and have activities on them are always another favorite, they stimulate your bird and provide them with more social skills because they are known to like, and respond to certain noises and motions. Chewing and pecking toys are great too if you get one that is a secret treat dispenser, foraging toys are good for encouraging natural instincts and will challenge your bird – this will be even more rewarding for them because they know they can find a treat if they work hard enough. There are no hard and fast rules for the materials used to produce bird toys, in general terms of course, you are best to check the toy you want to buy is suitable for your particular breed. Acrylic and plastic toys are predominant because they are easy to keep clean and are heavily abundant in the market. A rope is often used as well, as a chewing aid or a climbing aid, twisted ropes make great hanging toys and encourage exercise. Fabric makes a great toy too – often different fabrics are used to make a variety of foraging toys that are considered practical especially if your bird is prone to feather plucking. Natural materials like wood and leather are favorites because they are tough and can be made into any number of interesting and stimulating products. Color is often used because birds like that and they can see a wider spectrum than us mortal humans too – so more color is good. You should check of course, that any natural products have not been treated with anything that may cause potential harm to your bird. And as always, be aware that the size needs to be adequate for your bird, not too big nor too small. Birds are more like us in some ways than we think, for instance, if we have a child who has the same few toys for months on end, they will get bored and lose interest, as we would with having the same things day in and day out. Variety really is a valuable spice of life and you should always endeavor to provide your bird with as many different bird toys as you can. A good idea is to have two or more different sets, that way you can change them around on a regular basis so your bird will always have something different to play with. Offering different choices, and offering challenging toys will keep your bird’s interest and help them to stay happy and healthy. You may not think that bird toys need to be as safe as toddler toys are, but you need to be aware of some ‘hidden’ safety aspects that could harm your bird. You should check your bird’s toys on a regular basis for splits, cracks, and bacteria. Birds can choke too so if you have hanging toys or ladders – keep them maintained and safe and replace as soon as fractures or imperfections occur. Ropes need to be short enough to play on and chew, but never long enough or thin enough so that your bird can become entwined in any way. Don’t use toys made from Styrofoam as this could be a serious health hazard – the small bobbles are easily swallowed and are not digestible. If you give your bird paper towel tubes, make sure you cut them into smaller tubes; so the bird can’t insert its head and become stuck. Wood toys as good as they are, still need checking; birds don’t naturally eat wood fragments, but you may still want to remove older or harshly chewed pieces for safety sake. So, a few things here for you to consider when you’re choosing your bird toys, a little time spent before you make your purchase can save a lot of heartaches and unnecessary pain. As long as you always buy breed and size specific toys then you shouldn’t go far wrong, there are many reputable toy brands on the market, and hopefully this guide, and the following reviews will do some of the hard work for you, so you can choose the ideal toy and enjoy it with your feathered friend. To move onwards, some frequently asked questions are answered, in the hope that they may cover any queries you may have. As with all pets and health advise though, if you are in doubt please seek professional advice to ensure the health, happiness and long life of your pet. Q: Can I give my bird a bell to play with? A: That depends really if it has been designed as a bird toy and made with suitable and safe materials, there should be no reason why not. However, it is not recommended to give birds bells as standard because they are made with questionable materials and have slits in them that any bird could trap a beak, foot or leg in. Q: How can I fasten a toy to my birdcage safely? A: A great way to fasten is with rope or twisted material, it isn’t recommended to use split rings because they can trap a bird’s extremities and cause injury. Stainless steel chain can be used because it is safe, strong and won’t rust, but to further reduce any risk, never leave any excess that your bird can get stuck into. 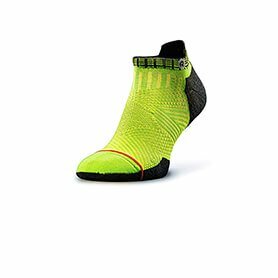 Quick links are recommended, they are available in many sizes and are less likely to cause injury. Q: Are wooden toys safe for my bird? A: Wood toys can be safe if bought from a reputable dealer and if they are a good fit for your bird and the bird’s size. To find out which birds do better with wood toys, seek professional advice to reduce the potential risk of harm. Q: Are man-made toys better than wooden toys? A: As long as the toys are specific bird toys they are both good toy materials, plastics vary in thickness and density so make sure you have one that isn’t too soft or hard for your breed, wooden toys do tend to last longer especially with excessive chewing, they can be more expensive but are made to ensure the safety of your bird. Plastic toys need to be checked on a regular basis to ensure they aren’t splitting as smaller pieces can cause internal damage if swallowed. Q: Is cuttlefish ok for my bird? A: Cuttlefish is a great source of calcium carbonate for your bird, and also encourages them to keep their beaks sharp and clean, not generally thought of as a toy they are, however, when checked regularly; a good perch and chew that will provide important and essential minerals. Q: Are mirrors ok in my birdcage? A: It has to be said that the jury is out on this one, some schools of thought believe it encourages communication and helps to entertain the bird. On the other hand, others have a belief that a bird may become overly focused on their reflection and become less sociable. A good practice may be, if you choose to put a mirror in your birdcage – is to take it out periodically so it isn’t a regular feature and the bird should be able to reap the full entertainment value it can offer without it becoming an obsession.